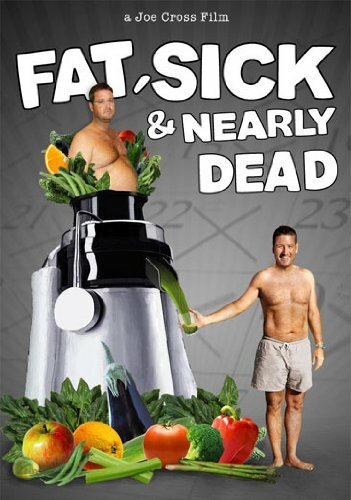 The documentary film Fat, Sick and Nearly Dead has become one of the fastest spreading messages on good health and good eating in the United States. In the film, producer and director Joe Cross takes his failing health and expanding waistline into his own hands, and changes his life. Diagnosed with an auto-immune disease that caused a chronic skin condition, Cross spent nine years going from doctor to doctor looking for the cause of his illness, all the while taking an ever-increasing number of medications to combat the outbreaks. An Australian in love with American burgers and Coca-Cola, Cross faces his demons head-on and makes America the battleground for his planned 60-day juice fast. He arrives in the U.S. with a film crew and a juicer with the intention of staying in New York City for 30 days, then driving across the county. Along the way, he talks to Americans about juicing and food and overall health. Quite by chance, he meets Phil Staples, a truck driver with the same illness. With Cross’ help, Phil begins juicing, eventually losing such a large amount of weight that he begins measuring the amount in bowling balls. Both men end the film healthier and happier, and no longer dependent on medication. I recently had the opportunity to interview Cross on the film and his life following the journey that changed his life. TDIV: Since you couldn’t have known the outcome of your journey in advance, what was it that made you decide to film your progress from the beginning? Cross: There were probably two main thought processes that brought that around. Number one was that I felt that if I put a camera on myself, it would help me actually do it. It was kind of like my community support system. Since I’d gone out and said to everyone, “Hey world, I’m going to do this,” I’d better do it. It was like a carrot and stick scenario. The other thing was that if this worked, I’d love to capture it because it might be able to help inspire and educate others. That made me want to go through with it because I didn’t think that I was the only person in the world who was fat, sick and nearly dead at that time. Cross: I think I just got fed up with outsourcing my health to other people and putting the responsibility in the hands of others, paying them and not getting results. In my mind, I needed a total radical solution, something that no one had recommended. If you’re in the predicament, personally, of having a hundred pounds of extra weight, I call it energy, in your body…plus you’re taking pills night and day just to get through that night and day…and one foot in the grave and you’re only forty years of age, you start to put in perspective who important things are in your life. Breathing and staying alive are probably the most important. I looked at the fact that I was in a catastrophic predicament. I needed something just as catastrophic to do the job. Then I wanted to find a happy medium. TDIV: In the film we see you struggle a little in the very beginning, the first few days you said you wanted to stay in bed. Did you have bad days after that? Cross: No. If you define bad days as physically bad days, then no. After the initial break and…I don’t like using the word ‘detox,' I think that withdrawal is a better term to use, the initial withdrawals ceased after 4 or 5 days. Now was I bored some days in the future? Yes. Were there days when I wanted to go out and murder a hamburger? Absolutely. But that’s not really a bad day or a bad moment, that’s just wanting something and not being able to have it. There were never days where I felt bad or was stricken to my bed, curled up in the fetal position because I was in so much pain, no. TDIV: What kind of diet do you follow now? Cross: I don’t think my diet would be considered outside of the mainstream of what we should be eating. I’m not vegan or vegetarian or living on any crazy, you know, bird feed. It’s a rare thing for me to have red meat. I eat bread every now and then, not a lot but if I’ve been exercising, then I’ll have some bread. But the big difference for me is that I eat a lot more fruits and veg now. So I make it a mission every day to consume more fruit and vegetables than I ever did before. It has become quite natural to me. I’ll have two or three juices a day, I’ll eat lots of salad, I’ll eat veg. I’ll still have desserts. I’ll still have the odd brownie when it feels right, but I won’t have one every morning for breakfast. It’s a shift from where only 4 or 5 percent of my caloric intake was from plant food to now where I try to make it 30-40%. TDIV: Besides overall better health, what is the best part of your new lifestyle? Cross: I think the best part is getting rid of the addiction. I was a slave to sugar. I would get up in the morning and drink a coke, then half an hour later I would have another one. If I didn’t have any, I would get in the car and drive straight for a store. It had full control over me…I don’t drink alcohol or smoke cigarettes…I don’t drink coffee. TDIV: Are still free of medication? Cross: Yes. If you had interviewed me last week, I would have said that I hadn’t taken any medications in 5 years. But last week I went to a dentist and was prescribed antibiotics. I argued with him but he said it was too big a risk. So I took his advice and took the medication. TDIV: I just saw you in the trailer for Hunger for Change. Can you talk a little about how you’ve become a healthy eating celebrity after your film? Cross: I think the reason why people relate to me is because I keep it real and I’m not a fanatic. And I will fall off the rails. There are times when I will have too much sugar. It’s one of those things where I’m in a very fortunate position to be able to talk to people, to be able to share my story, to be able listen, meet some really interesting people and learn more and in turn share back. So the fact that 3 million people have watched the movie means that there is an audience that would be interested in watching more content about this subject. I’m excited by that. Instead of being the character, like I was in the first film, I can try to shift into the role of host. I can try and share information that I learned, that the audience can learn. I think there’s a big wave coming of awareness in people who are interested in the food supply system in the world of nutrition. It gets me excited that I can be a part of that. TDIV: Are you going to be making more films? Cross: I don’t think I would use the word films just yet…I am generating content that can be consumed in 30 minutes or 40 minutes and is episodic about certain things that relate to the world of nutrition. But that doesn’t mean I won’t make more films but I want to have an idea that hasn’t been done before. TDIV: Will these pieces be available online? Cross: Absolutely. I definitely feel that’s where they would belong, but I would like to try to get some television exposure with them as well. If we make them interesting enough, then you never know, the BBC, Discovery Channel, Food Network, whatever, may be interested in picking up a series. But we aren’t specifically making them for television. I’m making it for the community that I’m creating and trying to nurture. TDIV: In the video message you left for the audience at The Seed, you said that you were working on getting Fat, Sick and Nearly Dead into other markets? Cross: Yes, we are going to be launching the movie into foreign markets by digital release. We are looking at getting the film into, hopefully, 50 countries…in over twenty languages. We are planning on making that happen in the northern Spring of next year. TDIV: Do you still keep in touch with Phil? Cross: Oh, yes. I speak to Phil at least once a month and we email back and forth 3 or 4 times a month. He’s doing great. I sponsored him this year into a nutrition course. He’s becoming a health coach. The film is spreading the word of health like wildfire. As an extension of his documentary, Cross has created an online community at www.jointhereboot.com and was thrilled to find that Fat, Sick and Nearly Dead is being bootlegged in places as remote from the American diet as Cambodia. "What an honor," says Cross. "They’re bootlegging my film in Asia."